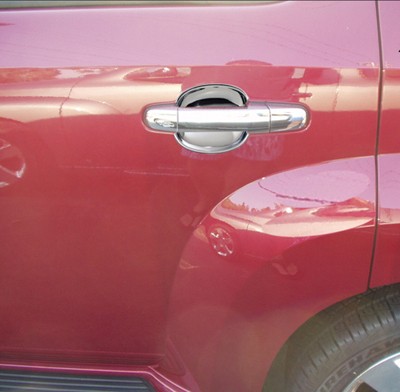 This four piece chrome door cup set will add a very luxurious look to your HHR. 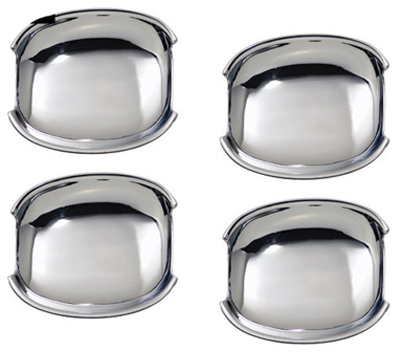 This liner set is made out of chrome plated ABS plastic. Installation is an easy job requiring about 15 Minutes. Application specific 3M attachment system and quality materials we use on all our products. Description Part # Price Buy Now! Note: 2CheckOut.com Inc. (Ohio, USA) is an authorized retailer for goods and services provided by PT Woody. All returns are subject to a 10% restocking fee. All of products are designed and manufactured for installation by the home enthusiast; however, we realize that not everyone has the time or desire to install their own package. We can install it for you at our Mt. Clemens, Michigan location, or you can have it installed by one of the many professional installation shops we contract with throughout North America. Please Call us for more information at 1-800-447-8410 Read more about our Return Policy.